Thanksgiving traditions of sharing food, fun and rest with our families can have life lessons for us all year round. Traditions don't have to be big and elaborate to be special. Sometimes the smallest things can really touch your heart. In addition, each family has slightly different traditions, which is one of the things that make them so special and unique. 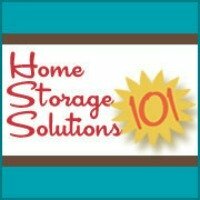 Here are some ideas for Thanksgiving Day traditions you may already enjoy with your family, or may like to start. They are also good starting places for reminding each of us how we can improve our daily lives, and strenthen the bonds with our families everyday, not just on this one day of the year. Normally, in today's society, which is so concerned with weight and nutrition, overeating is looked upon as a bad thing. Sure, there is a lot to be said for that, but on Thanksgiving eating and appreciating good, homecooked food made with love is the whole point. So sit back and really relish those favorite Thanksgiving recipes. If you eat slower you actually won't overeat as much, and appreciating that we can even put food on the table is a good thing to remember nowadays when times are tough. Sitting down with our families to eat is also something we, as a family and society, should be striving to do more anyway. Use your Thanksgiving dinner as a good opportunity to continue the tradition if you eat together frequently already, or to start it if you don't yet. Don't forget to say your Thanksgiving Day prayers as part of your dinner celebration. It seems like our society is always moving, always doing things. Have you ever just wanted to stop, and sit down, put up your feet and take a rest? Of course you have. We are entirely too "busy" these days. 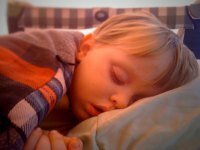 A great Thanksgiving Day tradition, whether from overeating or just utter relaxation with your family is a good old nap. This Thanksgiving take this tradition as a reminder to slow down the pace of your life, and your family's lives a bit, stop all the "busy" and just enjoy each other, and take a well deserved rest, not just today but also on a regular basis. Thanksgiving is not all about the food. It is also about family fun. 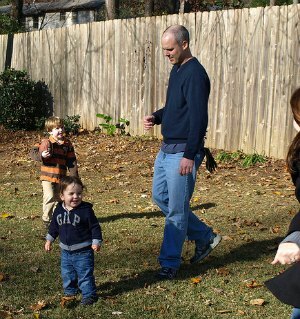 Some of the first thoughts we generally have of family Thanksgiving traditions are backyard football games. These can be a lot of fun, assuming the weather is nice. 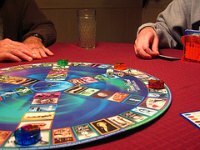 You can also have a fun family boardgame day to allow even more generations to participate in the fun, or even just sit back and watch a good Thanksgiving movie. 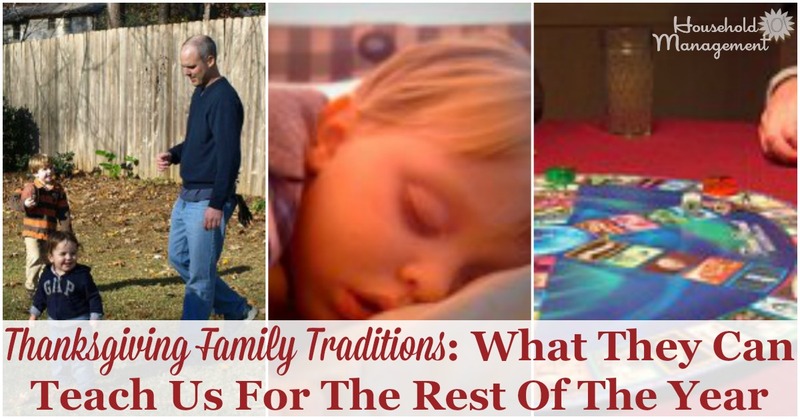 Whatever your family chooses to do for this tradition of family fun doesn't really matter as much as just making sure you treat your family as the priority it really is. That is the great takeaway message for the rest of the year too -- make it a priority to have fun with your family, regularly. 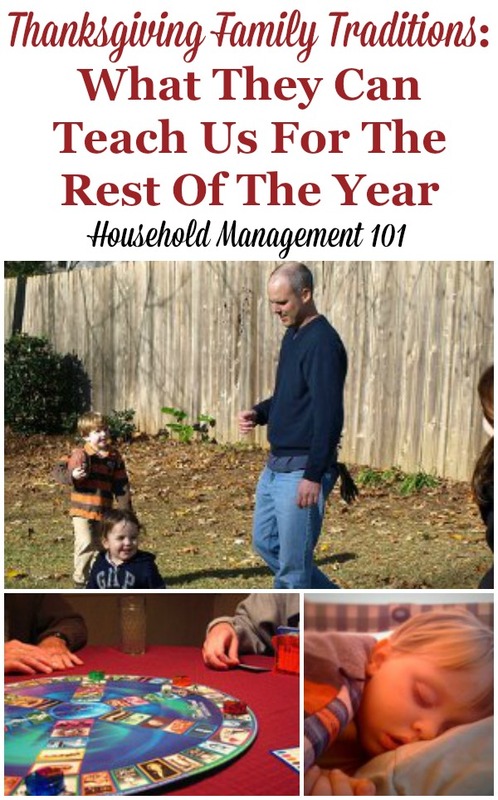 There are so many great ways to celebrate Thanksgiving and traditions we can start with our families, big and small. I would love for you to share some of your family's traditions centering around Thanksgiving in the comments.